Is PPG Industries Still a Good Value? The paintings and coatings manufacturer has had a great run, but is now the time to buy the stock? Painting and coatings manufacturer PPG Industries (NYSE:PPG) is a curious beast. On one hand, it's a true Dividend Aristocrat, having raised its dividend for the last 43 years at a compound annual growth rate, or CAGR, of 7% -- making it attractive to dividend seekers. On the other hand, its mid-teens growth rate and trailing P/E of around 27 times earnings make it the kind of stock only growth investors will take a look at. However, I'm going to introduce a third hand into consideration, and ask whether PPG Industries stock is a buy right now. The third hand is the one used to reflect on the cyclical nature of PPG's earnings. Valuations are always tricky with cyclical stocks, because the stocks frequently look expensive precisely at the moment when an upturn in their end markets starts to lead to sharply increased profits. Similarly, they can start to look cheap precisely at the point when their earnings start to top out. As you can see below, PPG and its peer Sherwin-Williams Co have valuations that are at historical highs. Incidentally, I am using enterprise value (market cap plus net debt), or EV, to earnings before interest, tax, depreciation, and amortization, or EBITDA, because it's one of the best ways to account for debt. 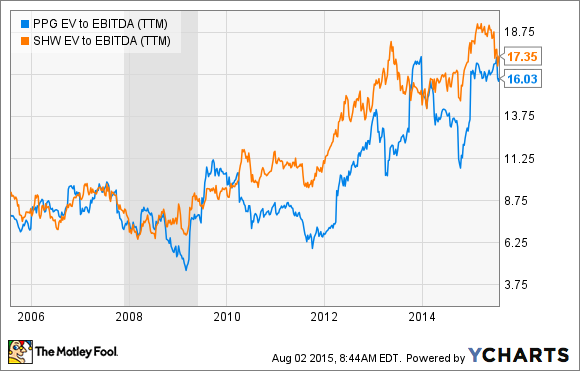 PPG EV to EBITDA (TTM) data by YCharts. Since 2012, both stocks have massively outperformed the S&P 500, with PPG up 155% and Sherwin-Williams 205%, compared to a 65% increase in the S&P 500. The question is whether PPG Industries is still a good value now. Frankly, on a forward EV/EBITDA valuation (a measure useful for factoring in the mid-teens earnings growth expected for PPG in the next few years), PPG doesn't look cheap. 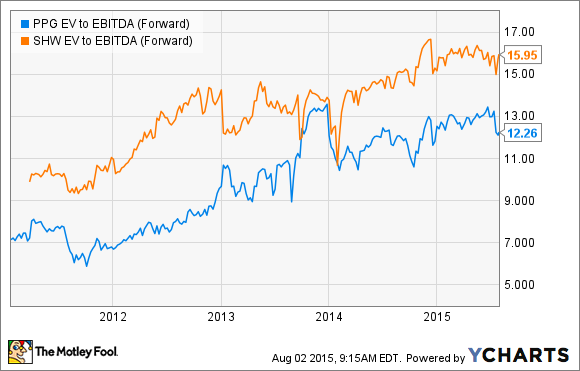 PPG EV to EBITDA (Forward) data by YCharts. A look at analyst consensus for earnings suggest some solid growth in years to come, but based on the current stock price of $108, it will take a couple of years before PPG's trailing P/E ratio is below 15 times earnings -- it's hardly cheap. That said, PPG's earnings are cyclical, and could improve given stronger economic growth or particular strength in its end markets. So let's take a closer look at its specific growth prospects. Does it have any upside potential to earnings estimates? According to the company, its key end-use markets are construction and automotive. In comparison, Sherwin-Williams has strong exposure to construction, particularly architectural coatings. PPG generated 93% of its revenue from coatings -- it has two coatings segments, performance coatings and industrial coatings -- in the first half, with the remainder coming from glass. Moreover, 50% of its overall coatings sales are to the original equipment manufacturer, or OEM, market (indicating strong cyclical exposure) so it's not a stock you would want to hold going into a recession. The key market here is architectural coatings, which make up 35% of overall coatings sales. The best way to follow North American construction activity is to look at the Architecture Billings Index from the American Institute of Architects. A reading above 50 indicates a future expansion in activity. As you can see below, the recent pickup is due to an increase in institutional and commercial/industrial sectors, while residential appears to be in the downtrend. Given that 65% of PPG's Americas & Asia architectural coatings sales are to the residential market, the upside to PPG's earnings from a pickup in North American construction activity is somewhat muted. Moreover, 75% of America's and 80% of Europe's architectural coatings sales go to the maintenance market -- suggesting stability in revenue generation rather than strong upside exposure to any improvement in construction markets. It's also difficult to see strong upside potential, based on current forecasts, for the automotive OEM market. China's vehicle production growth is slowing, with PPG's management affirming on its earnings call that it had lowered its volume growth expectations to 3%-5% from a forecast of 7% at the start of the year. Moreover, BorgWarner's management recently spoke of "slower light vehicle production growth in China and weak commercial vehicle markets around the world." As for North America, here is part of PPG CFO Frank Sklarsky's answer to a question from JP Morgan analyst Jeff Zekauskas on the earnings call: "...you have a continued improvement of automotive OEM, but not at the same acceleration. It continues to be positive. So that is one of the businesses continued growing, but not at overall 5% level." In other words, the rate of growth is slowing. 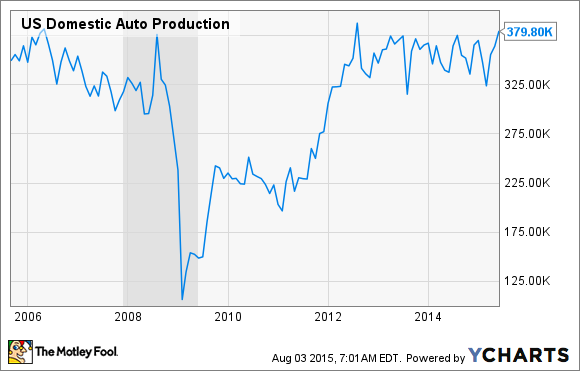 US Domestic Auto Production data by YCharts. All told, it's difficult to see significant upside to earnings expectations, at least from end-market conditions in PPG's two key industries. Given the current valuation, and some uncertain economic prospects in certain parts of the world, I would argue that PPG is not a great value right now.